Nestlé entered the UK with the takeover of the SMA brand in 2012. The aggressive methods it uses around the world as it competes with Danone (owner of Aptamil, Cow & Gate and Nutricia) have now reached these shores. As Clinical Network Representative, your role is to work on the designated territory, visiting hospitals, doctors, health visitors and community midwives to develop key clinical relationships within your local health Economies, leading to opportunities for the SMA brand and Nestlé Nutrition. 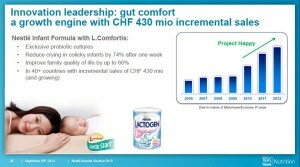 Nestlé is already breaking the International Code of Marketing of Breastmilk Substitutes and subsequent, relevant Resolutions of the World Health Assembly in the UK (as it does around the world). The job description states: “Finally, you’ll ensure adherence to all company principles and policies.” Yet these fall far short of the minimum standards Nestlé should be following. By Nestlé’s own assessment, 90% of the violations documented by the International Baby Food Action Network (IBFAN) comply with its policies. 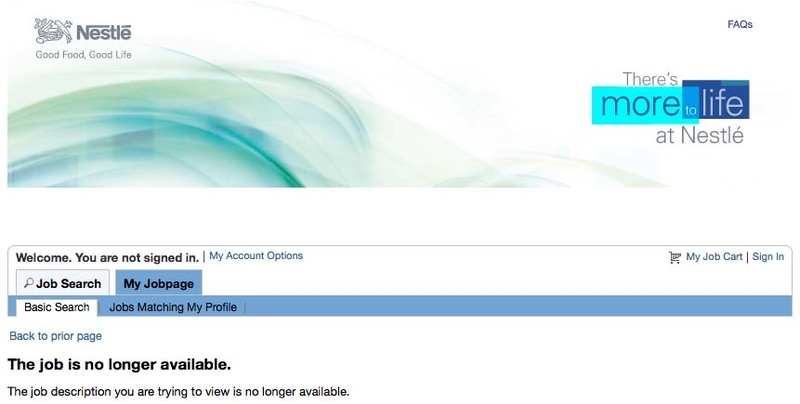 Update: Nestlé removed the job advertisement from its website a few hours after we posted this blog and shared it on social media, although it said it was due to run until the end of the month (though that is unlikely to mean the post won’t be filled). Click here for the saved version. I raised the ongoing violations with Nestlé Chairman, Peter Brabeck-Letmathé, in front of 2,446 shareholders this month. I showed a picture of a child from Bangladesh who had died as a result of unsafe bottle feeding, one of the cases studies in a 2014 report from the Bangladesh Paediatric Association. Nestlé promotes formula in Bangladesh with the claim it is the “gentle start” for babies, which it tells investors is a “growth engine” for sales. Mr. Brabeck knows babies fed on formula are more likely to become sick than breastfed babies and, in conditions of poverty, more likely to die. Would he stop these practices? He refused. Company representatives are prohibited from targeting staff in many health facilities in the UK as they are signed up to the UNICEF Baby Friendly Initiative. They are restricted to providing scientific and factual information to a designated expert, who can assess it and only communicate what is accurate and necessary. 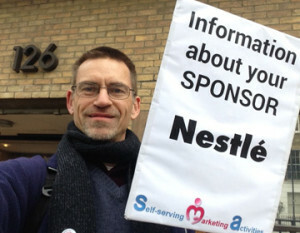 Nestlé set up its network of Nutrition Representatives to run events at nearby hotels in an attempt to entice health workers there so it can promote its products with idealising claims. We have organised protests outside these events, offering leaflets to participants encouraging them to consider the conflicts of interest. Health workers also have responsibilities to protect their independence. Baby Milk Action can help. The strategy Nestlé is building in the UK is familiar from monitoring its activities around the world. The forthcoming feature film Tigers, dramatises the true story of a formula company representative, who blew the whistle on Nestlé’s activities in Pakistan. We then had to bring another case as Nestlé continued to use the false claims on its website. Other violations in the UK include idealising images on labels, advertising of breastmilk substitutes in the mass media and direct targeting of the public with parenting clubs. The salary Nestlé is offering for this one marketing post is £36 – 40,000. That’s nearly 40% of Baby Milk Action’s entire operating budget for the year (our expenditure for the last financial year covers our office, travel, materials, member support, communications, attending conferences, staff and everything else). That’s not all on offer: “Nestlé has a strong benefits package which includes, for this role, a car, private medical cover, pension, bonus and 25 days holiday.” Bonus for what? In the Pakistan case it was for hitting sales targets for infant formula and other products. Nestlé will pay this one salary by selling more formula – formula could be cheaper for mothers who use it if Nestlé stopped its aggressive marketing practices. When Nestlé wins another customer it makes money. When we win cases at the ASA or stop Nestlé claiming its formula is the “natural start” for babies we earn nothing. When we stop a law being weakened or bring an improvement to a regulation, people may not even know how hard we have worked behind the scenes. Raising funds for our work becomes ever more difficult – last year we had a shortfall as a three-year grant had come to an end. If you want Baby Milk Action to be here to hold Nestlé and other companies to account, please think about making a donation. Update: Nestlé removed the job advertisement from its website a few hours after we posted this blog and shared it on social media (though that is unlikely to mean the post won’t be filled).